Since Class was announced last year, we’ve heard barely anything about the young adult series set in the universe of Doctor Who; today, the BBC revealed the main cast of the school-based series, as well as a few hints that make it sound a bit weirder and Doctor Who-ish that previously thought. Doctor Who Is Getting Another Spinoff Show... About School Kids? Although scant few details were revealed about the characters of Patrick Ness’ series themselves, the BBC confirmed that the main cast of school kids—who go to Coal Hill School, the Shoreditch high school most recently seen as Clara Oswald’s place of employment, but also where two of Doctor Who’s first companions, Ian and Barbara, worked as teachers—would be played by newcomers Greg Austin, Fady Elsayed, Sophie Hopkins, and Vivian Oparah. They’ll be joined by actress Katharine Kelly, best known to UK readers as Becky McDonald in the long-running soap Coronation Street, as well as recent turns in Happy Valley and The Night Manager. Oh dear. So at least one of them is an alien in disguise then? And that “legendary figure out of space and time” sounds an awful lot like a good place for a Peter Capaldi cameo. But at least we know a little more about Class now, and how closely intertwined with its parent series it really is, which makes it a much more exciting prospect than it formerly was. 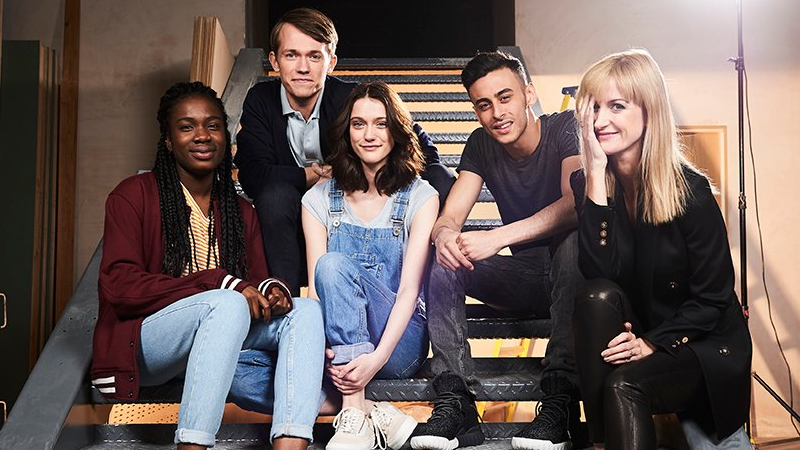 Class will air online as part of BBC Three’s rebranding as a digital-only platform in the UK some time this year, while it will air on BBC America in the US.